YES!!! Gryphon Audio is back in the USA! And Gobel Lacorde Statement Cables are here too! Up until now, audiophiles wanting to get a dose of Gryphon Audio, either had to travel abroad or go on the internet in hopes of getting a taste of its sound, recorded on someone’s cell phone and uploaded to YouTube. Not only can you come and listen at Delve Audio, in North Jersey, you can also hear Gryphon mated with Gobel High End Lacorde Statement Cables. This is an extremely rare opportunity. And well worth the visit. The reviews and short videos on YouTube do nothing to prepare you for the in person demonstration. Our goal is to share with you the super brands that make this passion for audio so rewarding. Give a call and setup time for a demonstration which we hope will thrill you…. We are open 7 days a week…. By appointment, for your convenience. You’ll receive a quiet, personal demonstration where you can take time to listen and learn about the range of Gryphon’s products. You’ll see and hear for yourself, what all the fuss is about! - Digital formats. USB: PCM: 44.1kHz, 48 kHz, 88.2 kHz, 9 6kHz, 176.4 kHz, 192 kHz, 352.8 kHz and 384 kHz up to 32-bit. • USB: DSD (DoP); DSD64 (2.822 MHz, 3.072 MHz), DSD128 (5.644 MHz, 6.144 MHz). Nearly 10 years ago, the Gryphon Diablo brought newfound credibility and respectability to the humble integrated amplifier. 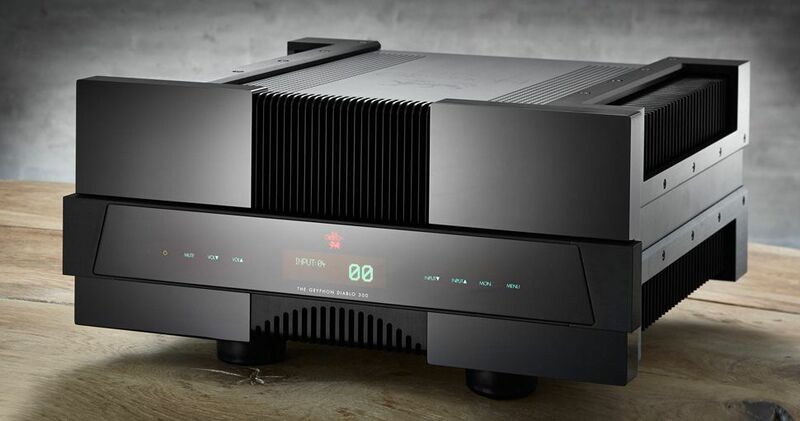 Previously the object of widespread scorn from audiophiles, the full potential of the integrated amplifier was finally realised in the Gryphon Diablo, so far ahead of its time that it - with typical Gryphon longevity – remained the absolute reference in its class for a full decade. - Custom-developed ultra-low noise regulated power supply for voltage amplifier stage (VAS). The eagerly anticipated Gryphon Colosseum is the first new Gryphon component since the Mirage preamplifier, the radical design experiment that laid the cornerstone for an esoteric third tier of Gryphon components. Representing the most comprehensive development project in Gryphon's history, the Colosseum Stereo Power Amplifer will enhance any home audio system. While the Colosseum takes Gryphon's distinctive styling one step further, our ongoing commitment to uncompromising sound quality is reaffirmed by a wealth of details such as 2 x 160 Watts Pure Class A output power, 48 High-current bipolar output transistors, a 340,000 microFarad power capacitor bank and flat frequency response extending beyond 350 kHz. Gryphon Mephisto is designed with zero global negative feedback in order to meet the dynamic demands of the very best analogue and digital source components. The exceptional bandwidth of the Gryphon Mephisto – beyond 350 MHz - is achieved despite the total elimination of feedback. Gryphon Audio Designs has an unrivalled track record for innovation in High End audio. In the field of CD player design, the story begins with our very first digital source component at the close of the previous millennium. 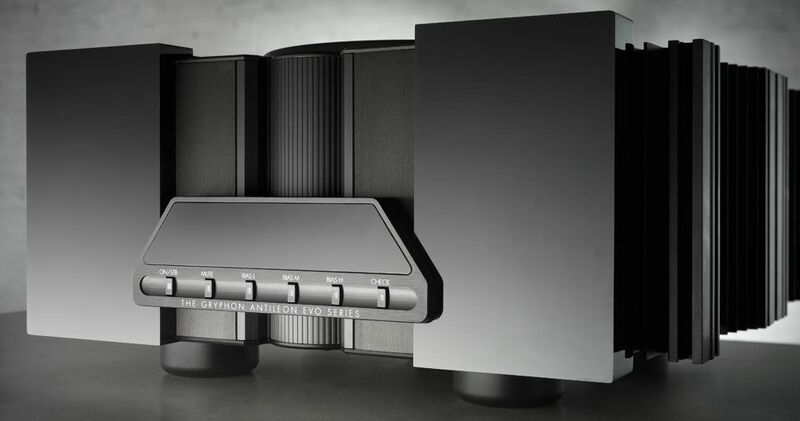 The Gryphon CDP-1 CD player introduced the world to the sonic improvements offered by upsampling, a technology now ubiquitous in digital audio. Refusing to rest on our laurels, the successor to the CDP-1, Gryphon Adagio, took digital musicality to the next level with asynchronous 24-bit/96 kHz sample rate conversion. After further refinement of this technology in the Gryphon Mikado, the implementation of 32-bit/192 kHz upsampling in the acclaimed Gryphon Mikado Signature represented another giant leap forward, once again breaking new ground and blazing a trail for others to follow. 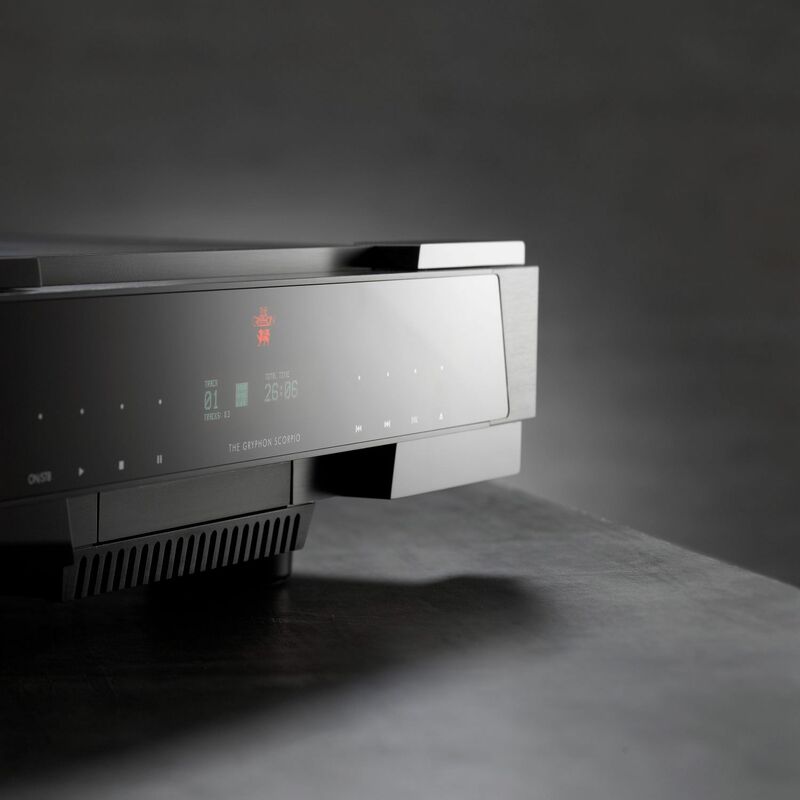 Sharing much in common with the flagship Gryphon Mikado Signature, the all-new Gryphon Scorpio front-loading CD player offers striking exterior design and build quality to match its advanced technologies and extraordinary level of musical richness, clarity and soul. Gryphon Scorpio plays compact disc. Period. Full stop. It does not play video discs of any kind whatsoever, nor does it play any of the so-called “high resolution” audio formats long since given the cold shoulder by music lover, audiophile and mainstream consumer alike. Gryphon Scorpio is designed unapologetically with single-minded dedication to the compact disc, because this focused approach enables Gryphon Audio Designs to devote all our resources and expertise to releasing the full, unfettered musical potential of CD playback. Gryphon Scorpio will reveal more of the hidden treasures in your CD collection than any other player, “universal” or otherwise, up to and well beyond its price point. That is its sole mission. - Three single-ended 75 Ohm BNC S/PDIF inputs. • Specifications can be changed by Gryphon Audio Designs without further notice. In keeping with every Gryphon loudspeaker before it, the Gryphon Pantheon incorporates specially developed constant phase technologies to ensure that all drivers are in phase at all frequencies at all times, eliminating deleterious slurring in the temporal domain, allowing the Gryphon Pantheon to re-create the original acoustic event with holographic realism and ultimate resolution. Constant Phase, Constant Musical Joy. 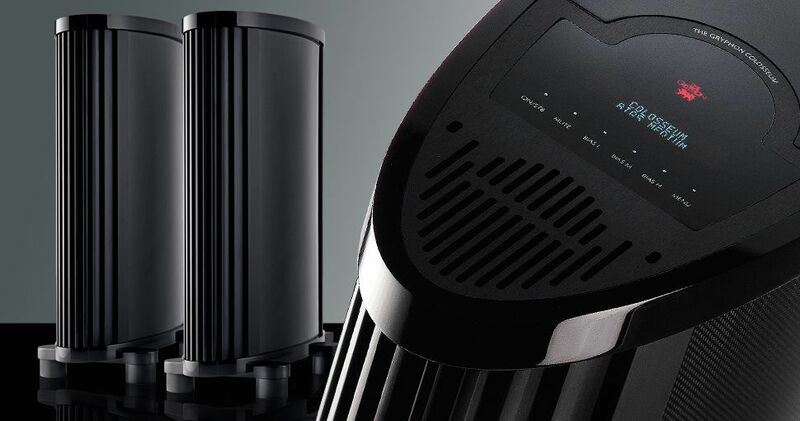 Like all Gryphon loudspeakers, the high-frequency range in the Gryphon Pantheon is handled by an extraordinary Air Motion Transformer (AMT) drive unit that moves air by driving an extremely low-mass folded metal sheet in a semi-perpendicular motion via a powerful magnetic field for instantaneous response to the audio signal. Because of its large surface area, the pleated structure moves a large air volume with minimal diaphragm motion, for a highly desirable point source sonic presentation. Eliminating fundamental issues of mass, inertia and internal resonance, the AMT high frequency driver offers lightning fast transients, combining flat frequency response well beyond 38 kHz with extremely low distortion and a total absence of compression. The cone drivers are custom designed for low Q and minimal dynamic compression to our exacting specifications by an internationally respected Danish driver manufacturer. The dual 8” bass drivers have been specially developed and mounted in a precision-tuned reflex chamber to achieve levels of bass extension and power rare in any loudspeaker, regardless of size and cost. The triple-magnet motor system ensures maximum force and focus. The tightly focused, ultra-linear triple-magnet system is also implemented in the dual 5” midrange drivers in order to ensure total control of the motion of the layer-damped fiberglass cones. Specially developed surrounds match the geometry of the driver diaphragm and the dust caps are non-deformable, low-mass and highly rigid. To achieve the ambitious objective of perfect phase at all frequencies and realize a truly seamless integration of the selected drive units, a fourth order filter network is utilised based exclusively on the finest components (Duelund, Jensen, Holm, Mundorf) in a layout carefully calculated to eliminate electromagnetic interaction and fitted to a decoupling platform to prevent vibration. Incorporating the very best high current, low-loss foil capacitors and low distortion, low saturation inductors with negligible DC resistance carefully selected for their sonic and electrical characteristics, the hand-adjusted Pantheon crossover network performs with impeccable precision and transparency. The purpose-built components are hard-wired with special Teflon hard-insulated silver solder. Minimal internal wiring with Gryphon Teflon insulated, silver-plated oxygen-free copper is employed. 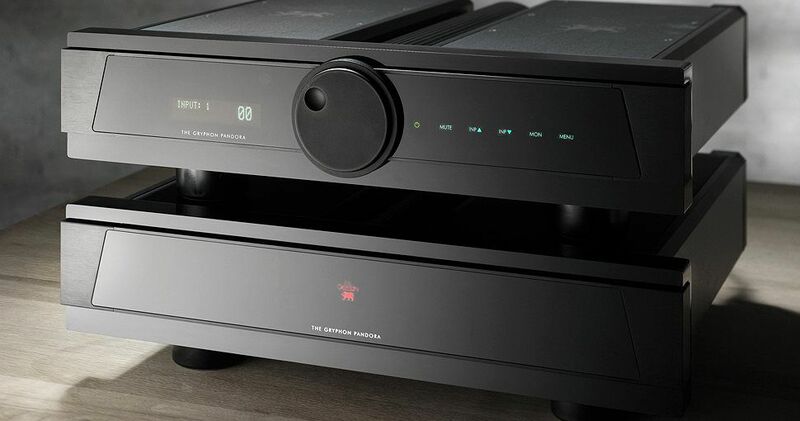 The crossover connects to a power amplifier via custom designed Gryphon screw terminals that ensure a tight and durable electrical contact. Tall loudspeakers with multiple drivers mounted in a long front baffle inevitably encounter issues of diffraction, resonances and flexing in the long, wide panel due to cone motion and the considerable pressure build-up inside the cabinet. Typically, manufacturers apply elaborate, complex measures in an attempt to tame these phenomena. At Gryphon, we adhere to the old adage “An ounce of prevention is worth a pound of cure.” In short, our “solution” is simply to elegantly sidestep these problems altogether. To do so, Gryphon Pantheon incorporates independent baffle elements for each driver, breaking up the pathway through which vibrations would otherwise be transmitted in a single, shared baffle. With an overall thickness of more than 7 cm, the organic design of the Pantheon baffle becomes the next best thing to an immovable object. The five separate Pantheon baffles also allow precision time alignment of the individual drivers based on the now classic, subtle Gryphon front baffle curvature. Meticulous attention has gone into the contouring of the baffle and driver surrounds to eliminate diffraction. Sound-absorbent material on reflective surfaces near the AMT high frequency driver prevents diffraction and smearing in the crucial time domain. Beneath its finely sculpted exterior, Gryphon Pantheon offers an inert, non-resonant platform for the drive units combining extensive internal bracing and damping material. The substantial feet provide a rock-solid foundation that lends the Pantheon system a firm grip on musical reality. The exterior design is distinctively Gryphon with a wide range of custom finish options and the opportunity to personalise your Gryphon Pantheon in the real-wood finish of your choice. 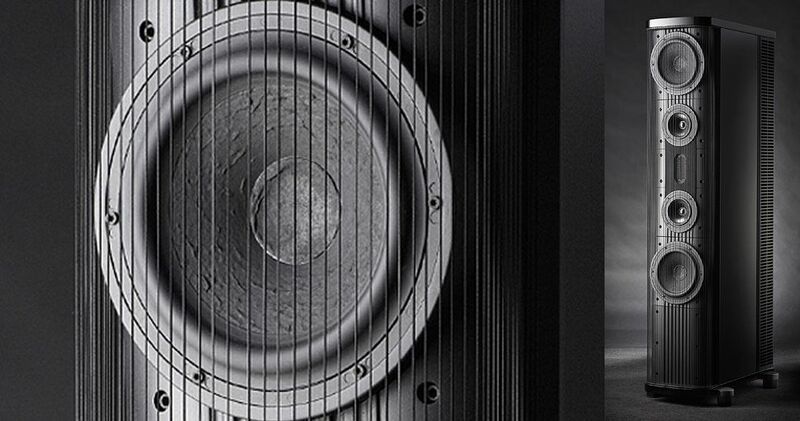 In selecting a finish for your Gryphon Pantheon loudspeakers, the possibilities are limited solely by your imagination. Because the side panels are based on a modular construction that makes removing and replacing them child’s play, your choice is no longer a one-time only, lifetime proposition. As a Pantheon owner, you gain access to virtually unlimited custom finish options, not only at the time of original purchase, but also at any time after that, as often as you desire. The high-frequency range is handled by an extraordinary Mundorf Air Motion Transformer drive unit that moves air by driving an extremely low-mass folded sheet in a semi-perpendicular motion via a powerful magnetic field. With minimal mass, the AMT tweeter, invented by Dr. Oskar Heil, responds instantaneously to the audio signal and because of its large surface area, the pleated diaphragm structure energises a large air volume with minimal diaphragm motion, for a highly desirable point source sonic presentation. Eliminating fundamental issues of mass, inertia and internal resonance, the Gryphon Mojo S high frequency driver offers lightning fast transients, combining flat frequency response well beyond 38 kHz with extremely low distortion and a total absence of compression. While such technologically advanced drivers rarely appear in comparably sized loudspeakers, Gryphon selected only the best to deliver Mojo magic. To live up to the Air Motion Transformer tweeter, Mojo S employs a vertical symmetrical driver array with identical SEAS 6” bass/midrange units with a free-air resonance of 44 Hz and a mere 7.7 grams of moving mass. Pulp paper cones, chosen for excellent linearity and controlled behaviour well beyond the driver’s designated operating range, eliminate any need for invasive corrective measures to reduce the negative effects of cone break-up. The Mojo S dual port reflex system is tuned to 52Hz with a flow resistor in the mouth of each port. Carefully calculated resistive porting eliminates the resonant ringing which is an undesirable side effect in so many bass reflex designs with forced vented alignments. Instead, Gryphon Mojo S offers ideally balanced low frequency response that seamlessly integrates the port contribution with the direct output of the bass/mid drivers. Dual 6” drivers provide larger surface area and high speed with minimal lag and overhang and allow a narrower front to reduce baffle diffraction. Built on die-cast baskets, the rigid, yet open, structure prevents built-up compression behind the cone. 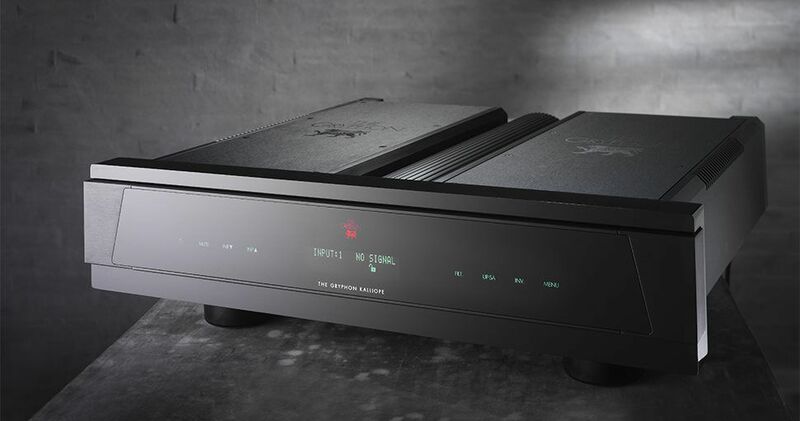 The Mojo S crossover network borrows heavily from a wide array of exclusive components newly developed for the top of the line Gryphon Kodo system. All parts are hard-wired point-to-point with special Teflon hard-insulated silver wire, eliminating high-resistance printed circuit boards. Extreme hand-trimmed Duelund graphite resistors, legendary Jensen air-core paper/oil inductors and reference class, low-memory, precision Mundorf capacitors are components rarely seen in commercial loudspeaker designs because of their prohibitive cost. It is even rarer to find this level of parts quality specified for a stand-mounted monitor of Mojo S’ compact dimensions. Exploiting the inherent roll-off of the AMT tweeter, a fourth order 2 kHz crossover network ensures linear phase at all frequencies a remarkable accomplishment achieved only by Gryphon Audio Designs. The filter incorporates external hot-swappable Duelund graphite resistors for three-stage, user-accessible ±1 dB tweeter adjustment. Empowering the user to adjust high frequency response for a seamless presentation without deleterious switches or rheostats, Duelund graphite resistors snap into place with convenient rear-panel clips, then connect with their original leads to screw terminals. The Mojo S system can deliver ideal high frequencies with mild roll-off (-1 dB), neutral response (0 dB) or mild boost (+1 dB) to integrate perfectly with the acoustics of the listening room. Typically, speakers claiming ideal time alignment employ a simple sloped front, because it is inexpensive to build and assemble. In order to achieve Gryphon’s uncompromising design goal of perfect phase at all times at all frequencies, the Mojo S enclosure incorporates a front baffle consisting of three separate angled sections up to 34 mm thick which attach to a 22 mm sub baffle. The independent driver frames and the main baffle are separated by a rubber gasket which simultaneously acts as a seal around the drive units to eliminate air leaks. The baffles are connected only via bolts and rubber rings to minimize vibration transmission. Meticulous attention has gone into the contouring of the baffle and driver surrounds to eliminate diffraction. Sound-absorbent material on reflective surfaces near the AMT high frequency driver prevents diffraction and smearing in the crucial time domain. The Mojo S baffle ensures true time alignment, for exceptional levels of transparency and musical realism. The treated baffle also reduces reflections from floor and ceiling, for enhanced clarity. Beneath its finely sculpted exterior, Gryphon Mojo S offers an inert, non-resonant platform for the drive units, combining extensive internal bracing and damping material. The elegant, open string grille discourages attempts by inquisitive fingers to touch the drivers. The rear of the cabinet is a dual-layer construction of aluminium and MDF. The crossover network is strategically placed inside to help break up internal standing waves. The inside side panels are damped with bitumen and the tweeter's own chamber is critically damped with a mixture of felt and wool. The speaker terminals are Gryphon’s proprietary five-way terminals also found on Gryphon’s finest loudspeakers and amplifiers. Gryphon Mojo S offers virtually unlimited custom finish options. Assembled using proprietary techniques, Gryphon products offer a service unique in the audio field: SideSpin, the ability to personalise your choice of finish not only at the time of original purchase, but also to replace side panels at any later date to keep pace with your evolving personal style and interior décor. SideSpin is a consequence of our philosophy that the Gryphon owner deserves not only sound quality to the highest audiophile standards, but also a unique and highly personal design statement equally pleasing to the eye. Gryphon Mojo S incorporates a specially designed integrated base with two polyoxometalate feet and a single metal spike for optimal decoupling from the floor for effective prevention of transfer of vibration. For totally inert support, the column is filled with sand to add mass for even more effective damping. The substantial supports provide a rock-solid foundation that lends the Gryphon Mojo S a firm grip on musical reality. Frequency Response: 37 Hz – 40,000 Hz, Room dependent Crossover Frequency: 2000 Hz, 4th order Sensitivity: 89 dB/2.8V Nominal Impedance: 4 Ohm Power Handling: 200 Watts Dimensions (WxDxH): 39 x 47 x 122 cm Shipping Weight: 65 kg. (one speaker) Specifications are subject to change without notice.